another exciting announcement from papertrey ink!! So joining Papertrey Ink as a member of the Moments Inked Team isn't the only secret I've been sitting on...I'm also going to be a part of the Quick Stitch Kit Team! What is a Quick Stitch Kit? They are entire "creative suites" designed to work especially with PTI's 100% wool felt. Each kit includes numerous dies and a whole ensemble of embellishments to work with to create beautiful gifts (and I LOVE to do that!). The dies all come with stitching holes so there is no guesswork, extra steps, or even the need for a sewing machine when you use them. Please be sure to check out Nichole Heady's blog today to find out more about these kits and to meet the rest of the amazingly crafty gals on the team. The first kit is called Sewing Staples and will be available to purchase on March 1st. I have a sneak peek of one of my projects today and there will be much more coming soon! But let me just say, oh my goodness, my notions-loving-heart fell head over heels for this kit! The dies make me want to create pouches and pockets and packaging for all of the sewing treasures I've collected from my dear grandmother's collection over the past few years. In fact, I could consider making pouches for just about everything, sewing-related or not! Because there might be some new people who will be popping in here this weekend on account of all the excitement over at PTI, allow me to take a few moments and introduce myself. I'm Rebecca and I live in Southern California. I'm an upstate New Yorker at heart but on a whim, I moved out to a mountain town in the middle of California 10 years ago. It was completely unlike me to have done that because I'm an introverted homebody who doesn't like change and had never even touched a snowboard or a pair of skis! Aside from missing my family and my small town life in NY, it was the best thing I ever did for myself and now I have a fantastic husband (Arvin) and 2 amazing little ones--Gus, 4, and Nemy (pronounced like Emmy), 2. I married into a Filipino family and if you know any Filipinos, you know how generous and loving they are so I'm quite lucky to have gained an extraordinary extended family through them. Every day I answer a gazillion and a half "WHY" questions from my 4-year-old: Why are there 100 people? Why do dinosaurs stink? (He meant why are they extinct?) Why are there germs? Why does pee smell like old roasted chicken? Between Googling the answers to these provocative inquiries and scratching my head wondering when in his short life has he ever smelled old roasted chicken, I tend to my small Etsy shop where I sell my handmade gift wrap and packaging products. It provides a nice distraction. I love peanut M&M's, black coffee, and music, with Ed Harcourt playing on heavy rotation for the last 2 months. I have an extreme phobia of vomiting and it's really important that you know that in case we are ever to meet face to face. Double design team congratulations to you! I'll look forward to seeing all of your Moments Inked and Quick Stitch projects in the months ahead. Loved your blog post! That little. 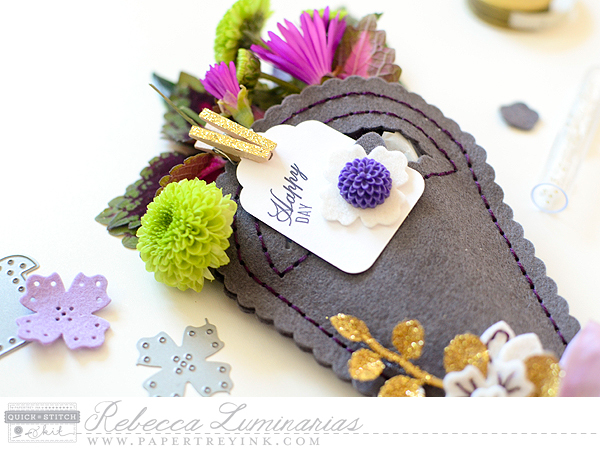 Flower die sure looks interesting and I have an aversion to anything sewing! The flower dies are awesome (and there are a lot of them!)! Congrats! Can't wait to see what you design for the stitches kits! Yay!!!!! Congrats!!!!!! I always love your work! Thank you, Amy!! I'm so excited! So happy to have you on board with us - one of my very favorite paper crafters! xo Your sneak looks so pretty. Can't wait to see what you've made! I certainly owe you a HUGE thank you, Danielle! This has been an incredible weekend! Oh my gosh, is there another person in the world with a phobia of vomiting? I thought I was out there on the edge of normal! Congrats, Rebecca, on being picked for TWO PTI design teams! I'll be looking forward to seeing all of your creations! Haha! I'm hearing about several people with this phobia now--I guess someone just needed to put it out there. But I still think we're probably on the edge of normal anyhow--and I kind of like that :) Thank you so much for your sweet comment! Congratulations, Rebecca! Wow, two PTI teams. I can't wait to see your projects. Congratulations Rebecca! I'm excited about the sewing kits and when my kids were little there were books with answers to those questions! :) I'm not sure what happened to them! (Maybe they've gone the way of all books, but there was truly a series of answers to oddball questions -- my kids never asked them though -- I'd wonder why my kid's pee smelled that way though! LOL!) I love peanut M&Ms and black coffee too! Thank you, Mary! I think everyone will adore the Quick Stitch Kits! I will have to search for those books--I need all the help I can get! I want to encourage him to always ask questions, but after awhile my head starts to hurt because I have no idea how to answer him. Though I'm sure this is every parent's dilemma when their children are this age, right? OMG. You're like my twin! I hate throwing up and freak out if I feel green. I live in California, probably right by you, and I lived in upstate New York (Finger Lakes Region) for most of my adult life so I do consider NY home, even though I was born and raised in California. You should email me some time! Congrats to you for joining PTI! Congrats, Rebecca! I'm looking forward to your future Quick Stitch kit creations! Oh my stars! I would rather do ANYTHING than vomit, so I'm with you there! And your little guy's questions..."Why does pee smell like..." had me howling! Can't wait to read more of your blog! Congratulations on the PTI gig!! !